The children's department of the Diocese of St Albans ran a workshop for leaders of childrens groups on Saturday 12th February at St John's Harpenden from 10am - 2.30pm. 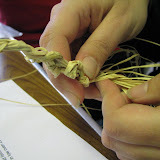 The day covered Inspiring Worship, Ideas for Storytelling, Food, Craft - creating an 'Easter Tree', Crosses, Music. It was a great day with loads of crafty ideas for workshops and teaching. Here are photos I took to remember the resources. Please contact me if you want to know more.